Sayyesha gets the Hot Hero !?! Jahnvi's next is kargil fighter! #Maharshi Expectation meter is just sky high! Will Shah Rukh prefer 'THIS' ?? ED freezes Karunanidhi grandson assets! Can KTR balance his Family & Politics? Local Paper predicts shock to YSRCP in Nellore! Jena Sainiks swing towards TDP MP Candidates in last minute! PK affect on Three Parties! TDP is in ruling or opposition? YSRCP is fear of two Jena Sena candidates in Krishna! Triangular Fight in Tenali and TDP Vs JS in Guntur (West)! Timing is not good for Mohan Babu! KTR should tell to which side Mamata and Akhilesh exist now? 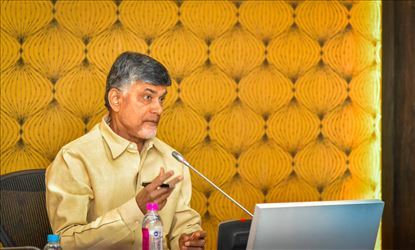 CBN strategy to win Kadapa Parliament! APR Vs BMR tough war in Nellore! Who cares about Mohan Babu, Chinni Krishna, Posani and Ali? Farooq stood for CBN, Can Owaisi back Jagan? Pavan immaturity or innocence helps CBN! Helicopter gives trouble YSRCP (FAN)! Vamsi stunned everyone with Nomination! Lokesh took risk where as Pavan played safe game! Anil loose talk helps Narayana victory! Tamil voters supported Sugunamma in Tirupati! Rajampet Congress MP Candidate gives trouble to Midhun Reddy! Vizag goes to Lakshmi Narayana! TDP underestimated Kodali Nani in Gudiwada! Is it cake-walk for Balayogi son in Amalapuram? Reason for NAMA sudden jump into TRS! Jena Sena impact in 12 Segments in East Godavari! YSRCP MLA nominees haunting PVP for money! Why Jagan avoided campaign on March 26th? Kanna will be the candidate of Vizag MP? Where is Vamsi? When he will file nomination? PVP gives rude shock to Yelamanchali Ravi! Jagan has option now for Vijayawada MP! Brown Eggs or White Eggs- Which is healthy? So have a story to tell… or want your written word to be published on Indiherald.... please do submit your stories here and our editorial team will get in touch with you. Title of Article Please enter your name! Description of Article Please enter your name! Enter Your Name Please enter your name! Enter Your Email Id Please enter your name! Enter Your Mobile Number Please enter your name!